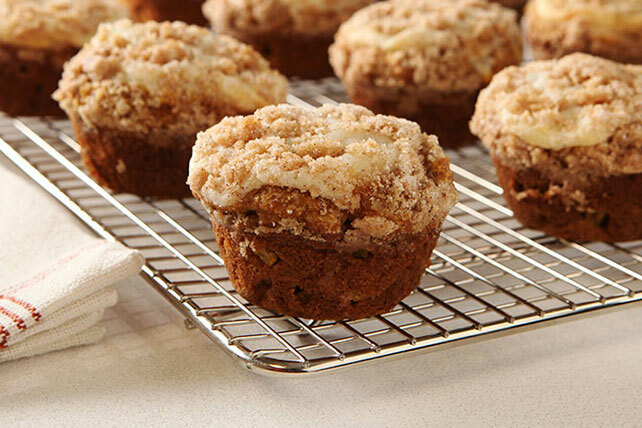 Take a bite of these delicious Pumpkin-Apple Streusel Muffins! Enjoy the combination of your fall favorites and make these pumpkin apple streusel muffins to keep you making more year after year. Spoon batter into 12 muffin cups sprayed with cooking spray. Mix cream cheese and 1/4 cup of the reserved sugar until blended; spoon over muffin batter. Press lightly into batter with back of spoon. Mix reserved flour, remaining reserved sugar and cinnamon in medium bowl. Cut in butter with pastry blender or 2 knives until mixture resembles coarse crumbs; sprinkle over batter. Bake 28 min. or until toothpick inserted in centers comes out clean. Cool in pan 5 min. Remove to wire rack; cool slightly. Substitute 1/2 cup golden raisins or chopped PLANTERS Pecans for the apple.